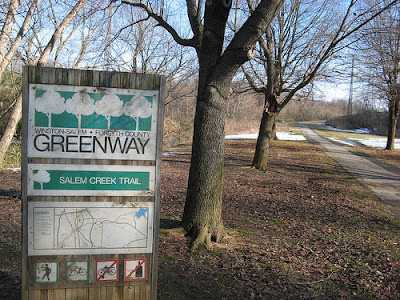 Greenways are linear open space corridors that can be established along corridors, such as creeks, utility or railroad rights-of-way, scenic roads or other routes. They may take a variety of forms including waterfront walkways, bicycle paths or multi-use trails, urban walking trails, hiking trails and wildlife migration corridors. They provide opportunities for healthy outdoor recreation such as walking and biking and access to nature. In addition to providing exercise opportunities, greenways can connect neighborhoods to community facilities and to one another. The preservation of natural areas and open space are another benefit of greenway corridors.